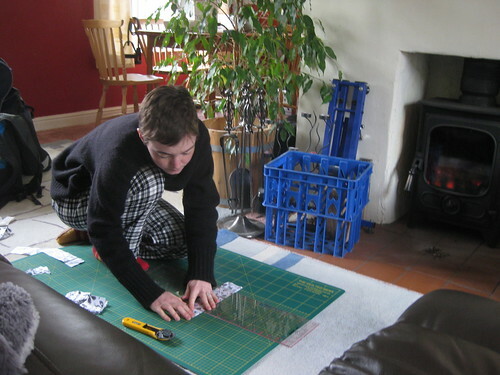 I worked from home last Wednesday, and whilst my code was compiling I came up with more plans for crafty projects than I think I could achieve in a year. Fortunately most of them will disappear back into the ether, and I won't miss them. I did carry through on two of them yesterday though. Last year we did a kind of mini quilting bee in my knitting group. We nearly made it all the way through before the motivation failed, although I still owe Kate her square (it's made, just never been delivered) and Annie hers (I never quite found the right material - lame). 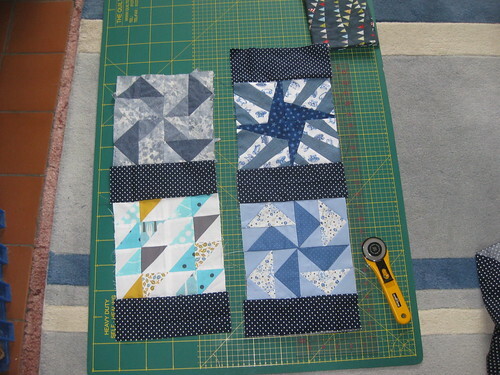 I did get four squares for my turn though, and I never quite decided what to do with them. Well, I decided. 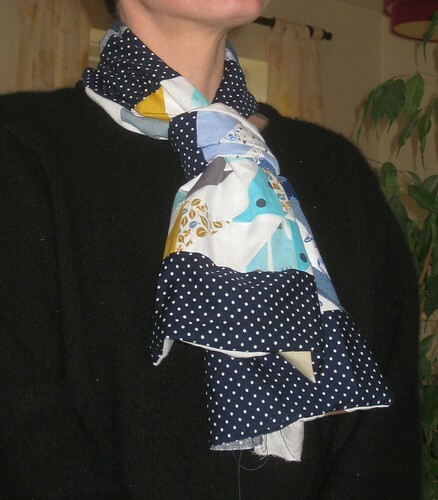 As a further experiment in slightly smarter dressing, I thought I could experiment with some scarves. I found a site that gives me many options on how to tie them (the Knot Library), and I reckon it's worth a go. 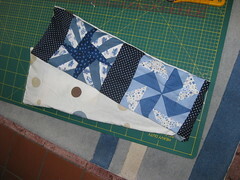 I joined the four squares with the blue, spotty fabric you can see above, and backed them with a bit of an old white duvet cover. I think it came out pretty well. That's a fake knot, right there. Thanks to the quilt bee participants! 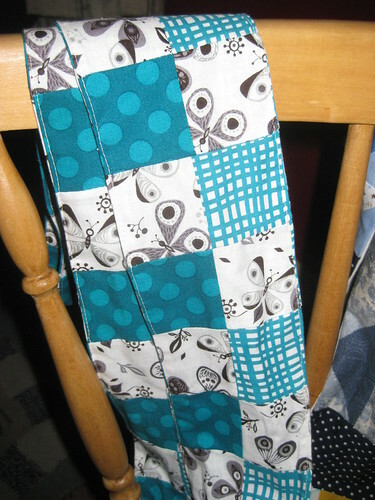 The other scarf I made was with fabric that Emma gave me for my birthday, and a left over butterfly print. I wanted something long enough to tie around my waist, to brighten up my black and white dress maybe, or possibly around the top of my new shorts. I worked it out, and went with a pretty basic square pattern. One of my very favourite types of days. Pottering around making stuff. 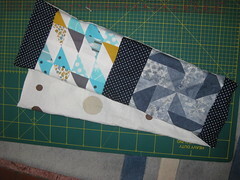 I love being able to take three pieces of almost square fabric and recombining them into a long, thin piece instead. Very handy, and kinda fun.